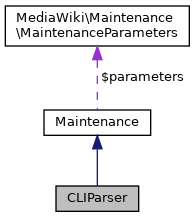 Maintenance script to parse some wikitext. Definition at line 62 of file parse.php. Definition at line 65 of file parse.php. References Maintenance\addArg(), Maintenance\addDescription(), and Maintenance\addOption(). Definition at line 78 of file parse.php. References initParser(), print, render(), and Wikitext(). Title object to use for CLI parsing. Definition at line 119 of file parse.php. References $title, Maintenance\getOption(), and Title\newFromText(). Definition at line 108 of file parse.php. Definition at line 129 of file parse.php. References $options, Maintenance\getOption(), getTitle(), and ParserOptions\newCanonical(). Definition at line 87 of file parse.php. Get wikitext from a the file passed as argument or STDIN. Definition at line 95 of file parse.php. References Maintenance\error(), Maintenance\getArg(), and wfIsWindows(). Definition at line 63 of file parse.php.